Some of AJ Burnett's outings this season have been tough to swallow. Charles Dickens would have been a big fan of A.J. Burnett because when the enigmatic righty takes the mound you can bet it’s going to be an evening of contradictions. Over at the ESPN Stats blog, Albert Larcada and Katie Sharp and presented some striking numbers that illustrate Burnett’s tale of two seasons. In his wins, Burnett is sporting a league leading ERA of 0.74, but in his losses, his ERA is a league worst 12.17 (among pitchers with at least five decisions). Quite literally, there has been no “in between” for Burnett. Sometimes ERA can be misleading, especially when dissecting samples into wins and losses. However, breaking Burnett’s starts down by game score reveals a similar trend. Burnett ranks second in the America League in starts with a game score of 40 or lower, but at the same cracks the top-15 with eight outings that had a game score of 60 or greater. No wonder the running joke among Yankees fans when Burnett starts is to ask whether the “Good AJ” or “Bad AJ” will show up. Although Burnett has had an incredibly frustrating season, his reputation for being wildly inconsistent really isn’t deserved. Last season, Burnett had 14 starts with a game score of 60 or more, which ranked ninth in the AL, but only turned in five stinkers with a game score of 40 or below. In fact, Burnett had fewer implosions than C.C. Sabathia (6) and Andy Pettitte (10). So, why has Burnett developed a reputation for being so unreliable? Again, the answer lies at the extremes. Even though Burnett had fewer bad starts than his rotation mates, his ERA in those games was a whopping 13.10, compared to Sabathia’s 9.38 and Pettitte’s 8.01. For whatever reason, when Burnett does not have his “good stuff”, it seems as if he stops competing. Although likely more perception than reality, the idea that Burnett in incapable of or unwilling to battle through a tough start likely also feeds into the negative image he has acquired. The Good AJ/Bad AJ paradox has really been a Yankee creation. In his one-plus seasons as a Yankee, Burnett has the fourth best ERA in winning decisions, but also the fifth worst ERA in losses. While a member of the Blue Jays, however, the divergence in his performance was much less. Without a doubt, AJ Burnett’s performance has always been judged against expectations. Despite having what many scouts have referred to as the “best stuff in the game”, Burnett has really never put it all together. Based on that disconnect alone, you can understand why Burnett is so often viewed as an enigma. This season, however, perception has actually become the reality. In fact, Burnett has often looked so conflicted that it almost seems as if the Good and Bad AJ are battling each other out on the mound. 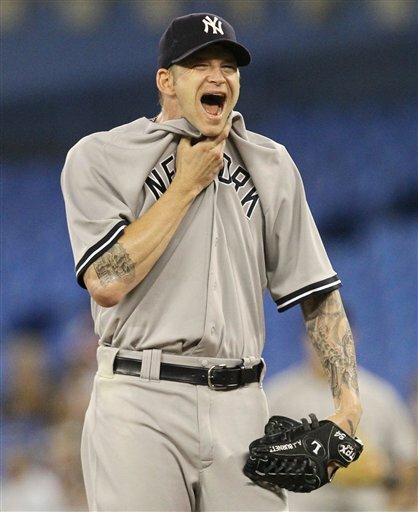 As Burnett gets set to the toe the rubber in Texas tonight, the Yankees have to hope the Good AJ wins out.